Cat fight wounds often get infected. 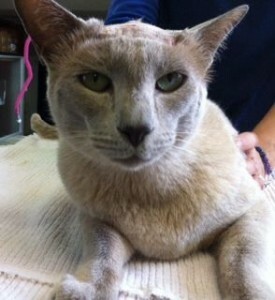 After recently publishing Nelson’s cat fight story, Mink came into Vet HQ after getting into a cat fight himself. 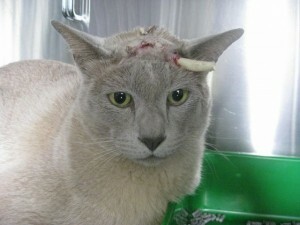 With another cat’s nail sticking out of his forehead, there was no questioning the cause. His owners removed the claw and his skin closed up but left bacteria trapped inside. 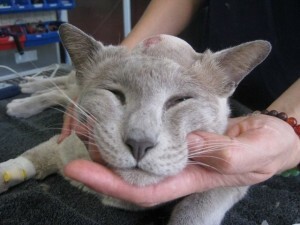 The bacteria grew and produced pus until Mink had a big, sore bump on his head. When these lumps are left for too long they can burst, leaving a very sore and infected hole in the skin. We opened up Mink’s wound to remove a large amount of pus and cleaned it thoroughly. We placed a drain in into the wound to help remove any more pus produced and placed him on a course of antibiotics. We removed the drain 3 days later and his head is healing up nicely. If your cat has been in a fight please bring them in to Vet HQ for a wound check as they often get infected and can make a cat very sick. Mink with a big, sore bump on his head. This photo was taken 3 days after mink’s procedure. The drain has been removed and he is looking great.